Casseroles are my favorite comfort food however the hubby, not so much. He would eat casserole dishes, just not a casserole fan like myself. After 30 years and tons of recipes I converted him. His Facebook page is living proof of this casserole conversion; It's loaded with fabulous casseroles just like this Chicken Cordon Bleu casserole recipe. In fact, I wouldn't have a photo to share with you otherwise. Anyway, casserole fans will love this rich, creamy, cheesy chicken and ham combo. You can use leftover chicken, any green vegetable or a combination thereof in this recipe. Swiss cheese is a must for maintaining the Cordon Bleu spirit! Mix soup, milk, and mustard in medium bowl; stir in chicken, broccoli and ham. Spoon into 2-qt. 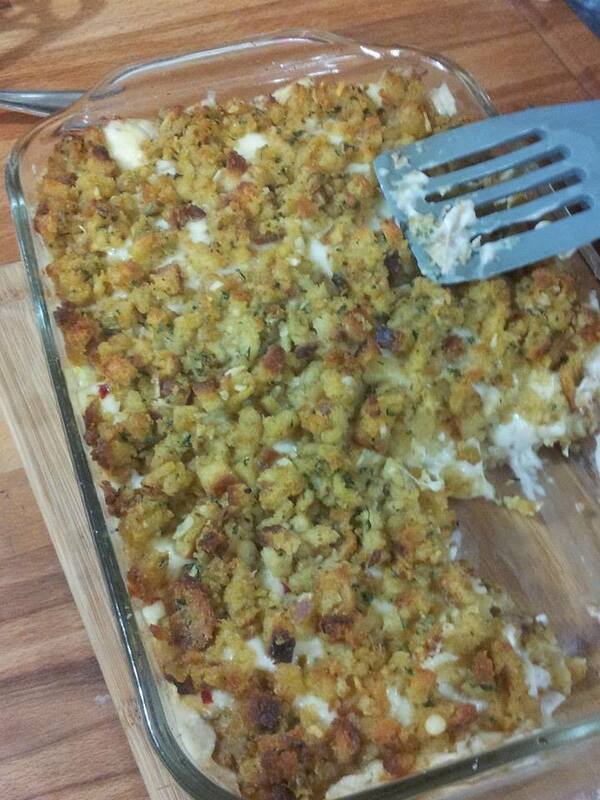 casserole dish sprayed with cooking spray; top with cheese slices and stuffing. ***UPDATED 5-22-17 *** The addition of evaporated milk made this casserole over the top rich and creamy.